What a firestorm my Comment is free blog post in the Guardian, “The Shocking News Behind the Crackdown on Occupy”, has unleashed: some have praised, while others have attacked. Joshua Holland’s criticisms of my piece, in a blog post, “Naomi Wolf’s Shocking Truth about Occupy is Anything But”, was picked up the most widely of the critics’ attacks. But the criticisms Holland poses are poorly grounded. Holland’s main premise is that I am part of a “flurry of speculation” that is without basis in fact, and that there was no federal involvement in the crackdown. I cited evidence that DHS was on the 18-member conference call of mayors, which Oakland Mayor Jean Quan alluded to in an interview with the BBC on 15 November, and my source was Wonkette on 15 November. Holland argues that his assertion to contrary has been qualified, and I am happy to adjust the citation accordingly. He is wrong on many counts. My evidence for federal coordination with local police exceeds the Wonkette citation, which was not, in fact, the basis of my confidence in writing about this coordination in the crackdown. I relied, rather, on many other sources of evidence. Among them, I was relying on what NYPD told me itself. I am certain that NYPD coordinates with federal authorities in OWS-related arrests because an NYPD official informed me that they did so through the bars of my cell, as part of his formal warning to me before my release, apparently to deter me from activities that might result in my rearrest. As I reported in the Guardian on 19 October 2011, part of the seventh precinct sergeant’s caution to me about what could happen to me if I was arrested again, if I “rejoined [my] friends the protesters”, was a threat based on his assertion of federal coordination with the arrests. He told me that in a second arrest, I would be photographed and fingerprinted, and the data fed into a federal database, to follow me forever. My partner, Avram Ludwig, confirmed that he was given the same warning about his data being fed into a federal database in the event of a future arrest. “We have filed FOIA demands with multiple federal agencies seeking public release of information related to coordination of the Occupy Crackdown. 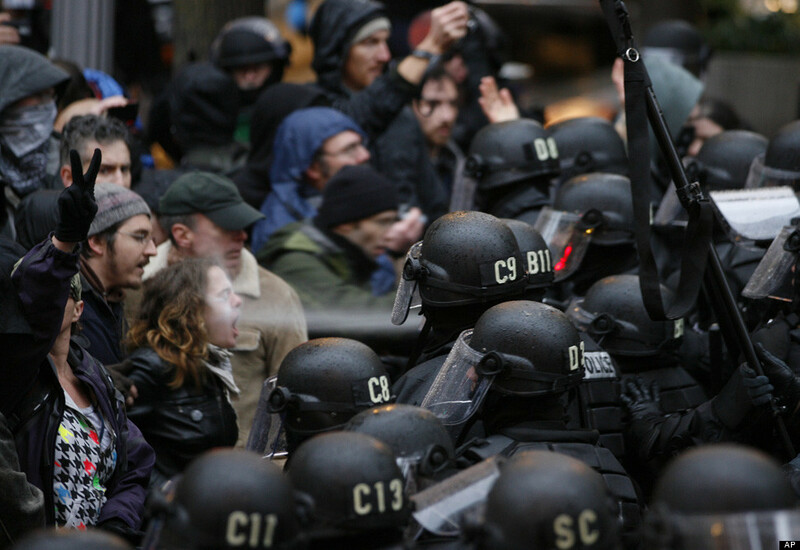 It is not credible for the federal agencies to suggest that they have no involvement in (and are somehow not paying attention to) law enforcement response to the Occupy movement both on a tactical and political level. “I am writing in response to your request that we limit our request for information regarding federal agency coordination or involvement in the response to Occupy encampments, to only that in possession of senior staff at DHS. You stated that you were making this request to media requestors and that all the other requestors had agreed and that we were the last one you were calling. You also stated that the DHS was intending to put the response to all the media FOIA requests on this topic, of which you believed there were 5 or 6 including ours, up on the web. “As I raised in our discussion, I do not know the substance of the other requests that were made, and whether they contained any similar specificity of ours so I cannot comment on them. You did indicate that at this time they were being treated without differentiation as to specifics of the request. “As I stated, we would certainly understand the agency prioritizing its search efforts to where it understands is the most likely location of responsive information. I would not assume that responsive information is solely contained among senior staff and think it likely that mid-level staff would carry out day to day responsibilities that would involve inter-agency coordination and work as liaisons with local law enforcement agencies and other federal agencies. “It is premature for us, as requestors, to narrow our search request and forgo our entitlement to receive and review materials responsive to our request as originally formulated. As you know, the public interest in this subject matter is substantial […]. “I understand from our phone conversation that this initial search is not being limited to the DHS Headquarters but includes DHS component agencies […]. “Because we do not know what information will be derived in response, we cannot agree to “narrow” or change our request to senior staff only. We cannot suggest or agree that whatever the outcome of that search, it could be considered fully responsive or sufficient, and thus request that when the DHS publicly announces its response on its website, it will not state or assume that the responses are categorically complete or satisfy all the FOIA requests on this matter. So it appears from this document, and from Ms Verheyden-Hilliard’s summary of her conversation to which it refers, that DHS is actively negotiating with at least one of the organisations that submitted the FOIA request, to narrow the scope of what the FOIA will compel the agency to reveal. This letter appears to confirm that DHS is arguing to limit the reach of the entities’ FOIA request: DHS is asking that the request only apply to “senior staff”, which would allow DHS to conceal the involvement of any number of officials and agents below senior levels. They are taking this position rather than simply turning over the initially requested documents. If Mr Holland were right, that DHS had no involvement in the crackdown, they would have no disincentive to do so. For Holland not to have made any such an enquiry – and then to conclude that the crackdowns were merely a result of local policing and local politics – is, in my view, seriously inadequate reporting. “DHS, on the other hand, appears to have located some documents responsive to my FOIA. I was contacted by an FOIA analyst a couple of weeks ago regarding my request and asked to “narrow” the search for responsive documents to “senior DHS officials” only due to the fact that there were multiple requests DHS received from others for similar documents and the staff, I was told, was ‘overwhelmed’. I agreed to do this in the interest of receiving documents sooner rather than later. I requested DHS expedite my FOIA and the agency agreed to do so. Holland’s conclusion that I have no evidence of DHS or federal coordination with municipal police on protest surveillance and management also flies in the face of reporting that goes back nearly a decade, documenting in detail the creation by DHS of “security zones” that do just this. It also neglects to address a series of press conferences in which Police Commissioner Ray Kelly has confirmed to the New York Times and others close DHS-NYPD cooperation in the creation of DHS-managed surveillance zones where public protest is federally tracked. A 2009 study by Jeremy Nemeth, PhD, in the publication Cityfutures, details DHS coordination with municipal leaders and police forces in New York, Los Angeles and San Francisco, that turned whole sections of these cities into DHS-managed “security zones” (see maps in the link below). Nemeth is not a polemicist; he is an urban design critic. But he points out how DHS has “militarised” – his word – the “downtown security zone” of the financial district, where the Zuccotti Park clearances took place. He also notes that Civic Center in NYC, as well as areas in the other two cities, have become DHS “security zones” in which the very fabric of urban design is directed by DHS guidelines, in close collaboration with municipalities and municipal police, to contain an extensive system of surveillance and data retrieval about citizens, geared to manage and surveil public assembly. Dr Nemeth cites the DHS term “Downtown Security Zones” in his title. The day after the clearing of Zuccotti Park, I was observing the protest site, which was ringed with unmarked white vans, which is no evidence, of course, of anything. But I also witnessed a white vehicle parked – illegally, suggesting that NYPD was leaving it alone – on the northwest edge of the square, on East side of the street, at about 11.30am. It was identified with blue lettering as “Downtown Security”. There is no business in New York City listed under that name. There is, though, a region of lower Manhattan, in which Zuccotti Park lies, as you can see on the maps in the Nemeth article, that Homeland Security has repeatedly, publicly and legally identified as the DHS “Downtown Security Zone”. There are other DHS “security zones” as well). In other words, this 2011 report indicates that DHS is paying NYPD three and a half times NYPD’s overtime budget annually: $180m of DHS money is spent on “intelligence gathering”; so $90m of NYPD’s budget, in one year alone, is from DHS. Thus, Holland and I are foolish to debate over whether there is “coordination” between NYPD and DHS. If you look at the numbers, financially, NYPD is, to some extent, DHS. Look at the Nemeth maps: geopolitically, lower Manhattan is, within certain boundaries, the province of DHS. This is true of Zuccotti Park, where NYPD received $25m to surveil and track license plates. “Since the 1999 Seattle protests, the involvement of the FBI with local police has followed a repeated pattern. First, an FBI counter-terrorism task force warns local officials, media and the public that thousands of masked “anarchists” will be invading their cities to break the law, fight the police, break windows and destroy property. They then advise that all protests be literally fenced into protest cages. To sweeten the coordination, tens of thousands of federal dollars are offered to local police forces for “security” [acquisition of the latest in gas grenades, launchers, surveillance cameras, even paper shredders in one case]. Young people and their convergence centers are targeted for prior detention, with the assistance of informants and provocateurs. Given these numbers, it is absurd to ask where, in Manhattan at least, municipal police are collaborating with DHS in managing public assembly. It is more reasonable to ask, where is it not? But why stop with Midtown? The new World Trade Center area will be yet another new “security zone” – with plans to give Ray Kelly jurisdiction, and with an extraordinary number of police – 600 NYPD cops, a veritable battalion – at the World Trade Center unit. “CLGC’s memo (pdf) proposes that the ABA pay CLGC $850,000 to conduct ‘opposition research’ on Occupy Wall Street in order to construct ‘negative narratives’ about the protests and allied politicians. The memo also asserts that Democratic victories in 2012 would be detrimental for Wall Street and targets specific races in which it says Wall Street would benefit by electing Republicans instead […] Two of the memo’s authors, partners Sam Geduldig and Jay Cranford, previously worked for House Speaker John Boehner, R-Ohio. Geduldig joined CLGC before Boehner became speaker; Cranford joined CLGC this year after serving as the speaker’s assistant for policy. A third partner, Steve Clark, is reportedly ‘tight’ with Boehner, according to a story by Roll Call that CLGC features on its website. First, I was referring to the “message coordination” that I was witnessing as rightwing commentators on television shows were using similar soundbites, as well as to the memo in question. Second, Holland’s conclusion that “there was no ‘message coordination’ of any kind” – a summary for which he offers no additional evidence – and his assumption that, because a self-interested ABA spokesperson said the memo was rejected, therefore it was rejected – is jaw-droppingly credulous. Holland also argues that since the proposal was made a week after the Occupy clearances, it is irrelevant; this also seems to me specious reasoning, as the Occupy movement’s impact, as the proposal itself notes in the goals for the future that it identifies, is directed at the future. Critics generally have attacked my argument as a “conspiracy theory” – that I am referring to a “shadowy elite” that wishes to suppress dissent. I am doing no such thing. I am referring to the elite in the light of day. There is nothing mysterious, opaque or even new about the nature of the self-interest I am describing; nor is my argument new. I first made the case that a small group of military contractors benefited financially from a hyped “war on terror” and the suppression of liberties in the US, in 2007, in my book The End of America, and backed it up with hundreds of footnotes: the argument, which spent five months on the New York Times bestseller list, has never been debunked. My recent blog merely updates the argument to address the “cui bono?” post Citizens United, in suppressing dissent – a “cui bono?” that may well now include Congress itself. What evidence do I have that congresspeople overseeing and funding DHS would be influenced by the wishes of their colleagues regarding their own financial benefits and freedom from oversight of their own financial transactions? I am frankly astounded that critics would find this assertion surprising; but less surprised that many of these critics are writing from outside the Beltway. I have not just covered politics as a journalist, but also participated in it as a political consultant, both formal and informal, to two presidential campaigns. (For Gore 2000, I was a formal campaign adviser: contrary to RNC mythology, my brief was not “wardrobe”, but rather policy on women’s issues, and messaging. I was also married to a Clinton speechwriter, and observed the message decision-making process from the perspective of a spouse.) As a professional courtesy, and also because I signed a nondisclosure agreement, I have not previously written about my campaign experience. But the general lessons I learned from it about how the system works on the Hill are disclosable. This is entirely misleading since congressional subcommittees don’t just hold hearings, they also draft legislation: “Subcommittees hold hearings, take testimony, and prepare the initial draft of legislation before submitting the bill for approval, revision, or rejection by the full committee.” Indeed, the Department of Homeland Security website itself, as you can see in the link, proudly shows day-to-day and, indeed, hour-by-hour congressional involvement with DHS intelligence reports, messaging and draft legislation. Holland may find it hard to believe, but from the experience of 14 months I spent in total as a formal and informal political adviser, it is unquestionable to me that Representative Peter King and others on the subcommittee overseeing DHS would be influenced by their own, and by their colleagues’, wishes for avoiding the financial transparency posed by OWS demands. It is also obvious to me that the White House would be influenced by Congress’ wishes on these issues, even though DHS is, indeed, part of the executive branch. This network of influence is simply how the system works. 4) What does this do for this candidate’s special interests? 5) How does this proposed idea, policy, decision or message affect the interlocking network around the leader that is made up of individual congresspeople’s own electoral needs; their own individual, high net-worth donor networks; their own special interest networks; their own financially-benefiting, revolving-door, former aides’ networks; and their own, or their relatives’ own, future work as lobbyists? (A distant, final “6” in the decision-making equation is some faint, remembered, youthfully idealistic impulse to good governance, or to actual problem-solving, which can be called upon if issues one through five have been addressed). Every decision, whether or not it is made in the formal organisational chart that my critics are pointing to, is filtered through a calculus of future reprisals, or future alliance-related benefits, from other members of Congress, both inside and outside the leader’s own political party. Can I offer formal documentation that this is how business is also done in relation to congressional decision-making about DHS, and then about DHS’s own decision-making? Um – duh! – no. Obviously, I have no such documentation of this role of congressional self-interest. These favors and calculations are not generally put in writing; nor are they presented to journalists in press releases. But is it crazy to address this role of influence and expectation on those on the DHS subcommittee, or for that matter on any subcommittee? As anyone who has actually worked on the Hill knows, it would be crazy not to. Because of a miscommunication on my part in the editing process, there are, indeed, two errors in my posted Guardian piece: “kale derivatives”, ridiculously enough, was a typo: it should have read “fake derivatives”. And I wrote that the Committee to Protect Journalists had issued a FOIA requests. This is incorrect. It was the National Lawyers’ Guild, among others. I have corrected accordingly. But as far as my central argument goes, I stand my ground. I have here presented additional evidence that NYPD and federal authorities coordinate efforts in the surveillance and arrests of OWS supporters. I have presented what appears to be DHS’s own non-denial, as of this writing, of potential lower level staff involvement. The oversight role of DHS by specific congressmen, as specified clearly on DHS’s own website, is clear. I argue still that congressmen and women have a confirmed financial interest in the status quo, which individual Occupy members’ first 100 answers to me about their agenda would directly threaten. The headline of my piece – which writers do not select – is “The Shocking Truth Behind the Crackdown at Occupy”. What I believe I wrote, rather, is an account of some shocking confirmed truths – and a call to raise some additional questions. I am glad to have corrected the errors in the posted piece, as well as added additional information about the sources of my confirmed evidence of federal/municipal coordination. But would I put that same essential call out to the public again, about the potential interests at stake that may be influencing the violence of the crackdown? Absolutely.